Rakcham is a small picturesque village located at an altitude of 2,900 meters, right between Sangla and Chitkul in Himachal Pradesh. It has a sparse population of 800 -1000 people. Unlike other famous Himachali towns, you’ll find uninterrupted peace in the town of Rakcham. If you want to experience a world with no newspapers, post-office, internet, police station, markets, and wine shop; just a couple of shops selling very basic necessities, you’re going to enjoy every moment here. You get instead are beautiful meadows, snow-capped Himalayas, and lush greenery all around. Watch out for the many apple gardens that add to the beauty of the place. Rakcham is the second-last village in India before the Tibet border starts. If you want to have an immersive experience, a trek through this village to Chitkul is highly recommended. The people of Rakcham migrate every winter for six months to lower altitudes and then come back in April to sow seeds and tend to crops. They are mostly nomads in their way of living and are known as Kinnaur. The primary occupation of the men here is to take care of their sheep and cows, while the women are involved in farming and daily household chores. The locals here are extremely warm and welcoming and flash a friendly smile to anyone passing through the narrow lanes. In terms of sightseeing, there are two temples in the village, dedicated to Goddess Kali and Lord Shiva. There’s also a Buddhist shrine, which reflects the culture of the Tibetan people. Reaching Rakcham is easy; it is well-connected to major cities like Shimla and Delhi. Throughout the town, you will find a typical blend of Hindu and Buddhist ideologies. 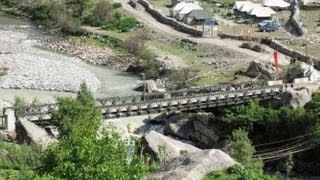 If you’re planning a trip to Sangla Valley, don’t forget to include Rakcham (pronounced ‘Rakshyam’) in your itinerary. The distance between Chandigarh and Sangla is close to 360 km and the journey takes about 12 hours. 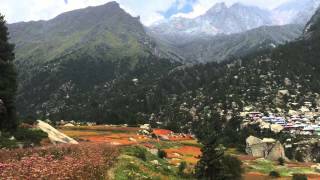 Sangla is a small town in the Kinnaur District of Himachal Pradesh located at roughly 10,000ft. Sangla valley, it is also very close to the Tibetan Border. The Baspa River flows in the Sangla Valley, that also offers a never-ending sight of the Himalayas, dark green Cedar trees cover the mountain slopes and many glacial streams gush through motorways. This area offers the world’s best quality apples.The most significant achievement for this region. A signature walk of the valley, this route was used regularly by the villagers from Batseri to go to Rakcham. It is a fascinating walk/trek through the forest.